I’ve got twenty six minutes before the school bus, and we’re marching down the Banbury Road at a cracking pace. 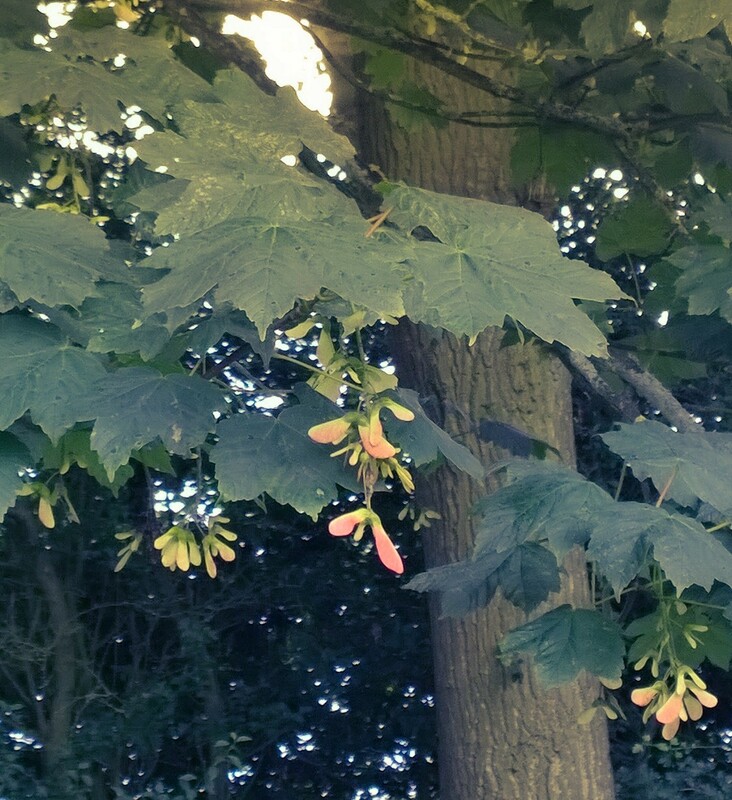 I’m soon distracted though, by the large green keys on a sycamore. Some of the lowest have a pink blush, as if they’ve been dipped in a strawberry daiquiri. Down near the bridge, I pull the dogs to a stop again to stare at a lacy saucer of ground elder. On a three inch radius, there are no less than seven pairs of bonking Cardinal Beetles. Between some couples there is less than a quarter of an inch, and I can’t help wondering about etiquette – what if a bonking beetle bumps another bonking beetle and there’s bonkus interruptus? What if one beetle fancies another beetle’s beetle, or if a lone handsome beetle flies in, would the other beetles chat it up, or would there be a brawl on the saucer? These thoughts occupy me all the way down to the bottom fields, and I walk out from beneath the oak to a field of ripening, fat-eared wheat. The stalks are still green and the nubbles of corn are still soft. I trip over a mole hill, then notice that a mole has dug its way in a perfect line along the footpath. Near the bridge into Emma’s Meadow, there’s a monster hill, as if the mole went berserk and dug an underground palace. Pants wees on it. I’m too scared of the cows to go into Emma’s Meadow, so I sit on the bridge and look back over the wheat. There’re great swathes of rye grass waving through the crop, shimmering in the sun. There’s Blackgrass too, with its bristly close-grown seeds. I wonder how farmers get it out of the harvest, or whether we end up eating it. The dogs have disappeared into the margins, where we walk in the winter. Pants is singing, which means he’s found a mouse or vole; thank God he never catches them. Bus-o’clock is drawing near, and I call the dogs. I can’t go in after them: the margin is impenetrable with hog weed and grasses way taller than me. Even the heads of clover around my ankles are as big as golf balls. I give up waiting and start walking home, knowing they’ll come when they realise I’ve gone. I can hear the dink-dink-dink of a hammer from the Drying Barn at the end of the village. I’ve heard the domestic sound of a Hoover practically non-stop all day, making me feel guilty for being such a slattern in our house. The din’s being made by Dave and Chris, gearing up for harvest; anticipating the toil, sweat, dust, then the pay-off of a barn full of grain. It’s the time of year that I feel the most jealous of farmers, their sense of purpose, focus, of gambles against fate. The knife-edge tension of the weather reports, the whipping out of moisture gauges then the best bit: go-go-go. As a child, I’d watch our neighbours’ barns with binoculars, trying to guess if today was the day the combines would roll. The dogs catch me up as I stop to observe a two-spotted ladybird, and Pants jumps up my white Capri’s to tell me what a clever boy he is. ‘Gerroff,’ I tell him, walking on. ‘Silly silky pair.’ Dora speeds ahead, as if she’d looked at my wrist-watch. She waits by the oak, impatient, panting. Bus o’clock, her eyes tell me, Hurry up. Bus o’clock! I’m going to have bonking beetles in my head for the rest of the night! Seriously! There were so many! Hope you’re well, Terry.